Danny East has been set a 90-minute target before making his long-awaited first-team return. The versatile performer scored a goal and created another in a 25-minute reserves cameo against Leyton Orient on Tuesday afternoon. It was his second match back following a pelvic injury sustained in pre-season training. In his absence, Adam Webster, Alex Wynter, Joe Devera and now loanee Matt Fish have featured in the right-back slot East previously occupied. Now the 22-year-old is inching his way back to fitness, the 4-1 Brisbane Road result adding to a 30-minute outing against Newport County the previous week. But Paul Hardyman has warned East will not be ready for first-team action until he has completed a full 90 minutes for the reserves. And with the next reserve fixture at home to Peterborough on January 6, the wait will have to continue. 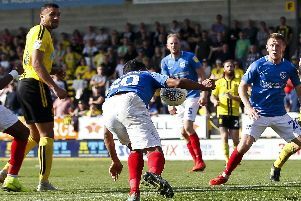 Pompey first-team coach Hardyman said: ‘We put Danny in a number 10 role against Leyton Orient – I told him to run around and act like Wes Fogden and he said that would be a hard act to follow! ‘It was a bit of a free role and he just needs to get some confidence back in himself and prove he is past his injuries. ‘He has done that, he was blowing a bit after a couple of runs but you would expect that, you can do all the running you want but it is match practice that counts. ‘The idea was to give him a chance to run around. Last week we put him on in a wider position to get back into football, not in the hubbub of the middle of the pitch. ‘Now we have introduced him in the centre of the pitch by giving him a free role, allowing him to create his own space and his own chances – which he did. ‘For the next game we will probably put him in the centre of midfield or right-back, which he is known for. ‘He needs to get 90 minutes before he will be considered for the first-team and that will be in the new year, but in that Christmas period he is going to get a lot of training. East netted Pompey’s fourth against Orient, taking Andy Barcham’s pass and finishing smartly. Earlier he had crossed from the left for Barcham to head home at the far post, with Nigel Atangana and Johnny Ertl the other scorers. And Hardyman will keep easing the former Hull player into the action. He added: ‘We have got to drip-feed Danny back in, he has been out for a long time.